19th century French velvet upholstered settee with turned wood legs. French 19th century settee upholstered in silvery grey satin. 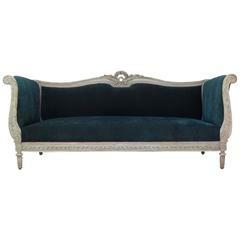 French Napoleon III period tufted settee in muslin. Legs and structure are in very good condition; settee is upholstery ready. Casters on front legs can be added upon request. 19th century French ebonized wood settee. Newly upholstered. 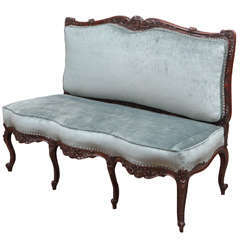 Lovely and elegant 19th century French Louis XVI style upholstered settee, hand-carved with painted finish, circa 1880. 19th century French beautifully carved walnut armless settee with flower basket motif. The settee has been newly upholstered in velvet with nailhead detailing. 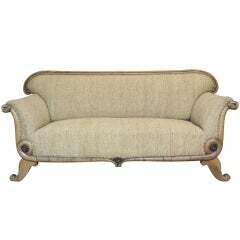 Comfortable and fluffy 19th century settee from France.